Years ago, I thought of modern interiors as all cold hard lines and straight edges. Sleek and cool, yet not something I would ever want to live in. Today, my ideas about what is modern in design are completely different. These rooms by Yvonne Ferris Interiors, beautifully illustrate what now defines well designed modern interiors. Warm and inviting and completely “livable”. This is the softer side of modern, and I love it. The shelves with those quirky pictures are just perfect! I'm all about soft mod- love the black and white palate and the windows are amazing! I completely agree. I used to find modern too harsh, too empty, but now I think I prefer modern. I have slowly been gettng rid of my all too traditional pieces. Lovely pics! Oh swoon over the table in that first picture!! 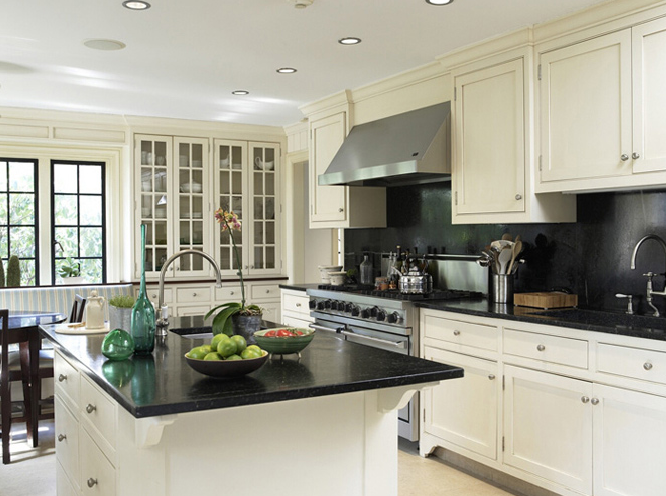 I love those black windows in the kitchen! Yes, have loved her work in CT C&G. Her neutral spare palate works successfully in both modern and classic architectural interiors. u put them in the 'modern' category – i dunno if that's where i would put those rooms – i keep talking about it on here – but i'm gonna go to my friends house and take pics of her home – they bought it from a designer (which was more traditional) but they are ulta modern (there jet setters with 3 kids, unreal, right?!) … their decor design and mine are the same – i thinl u'd totally enjoy looking at their home – i gotta get their when they get back from yet ANOTHER mini-vacay ,, *sigh* ..
PS – want FREE art? – come 1 come all and *JOIN PHOTOgraphy Give-Away * .. if you interested of course! Agree. Little by little people are realizing modern is not a specific look. I love the image with the dark floors and coffered ceiling! We went modern a few years ago when we moved and I was a bit hesitant at first but now I love the clean lines. Those windows in the 2nd to last image are delicious. I just went crazy over that black bookcase! I really like the idea of black furniture against a black wall, lovely! Whoa… lots of beautiful images here. Love the mixes of furniture styles and the turned wood in the first image. I could definitely live in one of these "softer" modern spaces. Thanks for sharing! I think modern is definitely going softer. These are beautiful images. That 3 pic. is all in my taste. Gorgeous black bookshelf full of personal stuff(+ book obviously):). Also adore the white sofa(on my want list) and the black and white cowhide on the floor along with the dark(black) wooden floors. im crazy about the more modern look – so love these!! Beautiful! Definitely a side of modern that's totally liveable – I'd happily live in any of these rooms! oh my, what beautiful images! Thank you for popping by my blog, so happy to have found yours, it's beautiful. Nice. Modern Trad. Love it! I love modern elements mixed with softer colors and vintage accents. So pretty! If that's modern then I totally am a modern gal. Love it! Those bookshelves are a sight to behold! That dark sitting space is amazeballs. I think there is a big difference between modern and contemporary. For me, contemporary can be cold and hard, but modern is classic. Yes, I felt just as you did, but this is a twist on modern that I could DEFINITELY live in! It's really lovely and I especially love the kitchen. Beautiful…I love the softer side of modern. The mix of modern with more traditional. This is definitely a modern I could live with! I can take modern if there's some warmth to it–more of a transitional style, really. Very nice images. I love the modern style. Clean, simple lines. White + dark = LOVE! I just love the contrasts. These are literally my dream spaces. Especially the first one. It is magnificent. modern can be so nice, especially when it is warmed up and made cozy and comfortable! Love this house, the modern made cozy. Congratulations, this is a very nice post. I absolutely love modern and traditional; and sometimes together! Our Hamptons home is what I call modern with a comfortable chicness about it and our primary home is more traditional, yet with modern day sensibilities! I love anyone who paints paneling black. Just lovely. thanks for stopping by my little blog. i'm sure you found your way via alison :). she's doing a great job. glad i stumbled upon yours as well…it's filled with amazing eye candy. congrats, also, on your new retail venture! i'm sure it will be a huge success. I used to think the same thing about modern, yet now I find myself wanting to mix modern elements in with my more traditional pieces to add some flare. I just love the images you shared, Sue! please write a coffee table book. You could have sections based on all your clever categories. our reno is under way, and I would love one room dedicated to "zhush" – your names are always spot on. I love this look. Especially Neo Georgian, its so clean and fresh. I obviously love all of the black and white, and love that her rooms might be modern but still have stuff in them. I think that is what intimidates me most about "modern"- lack of stuff. These seem liveable though. I just love every picture of this soft modern design! Gorgeous post!! I'm usually not a big modern fan, but these pictures looked great! I agree completely. I know that for me it has to do with when I was born (eeek! ), because when I grew up 'modern' DID mean stark white, sharp edges, harsh and a tad sterile – in a Studio Line kind'a way. This house is yummy. It's clean and sleek and scaled back without being cold.